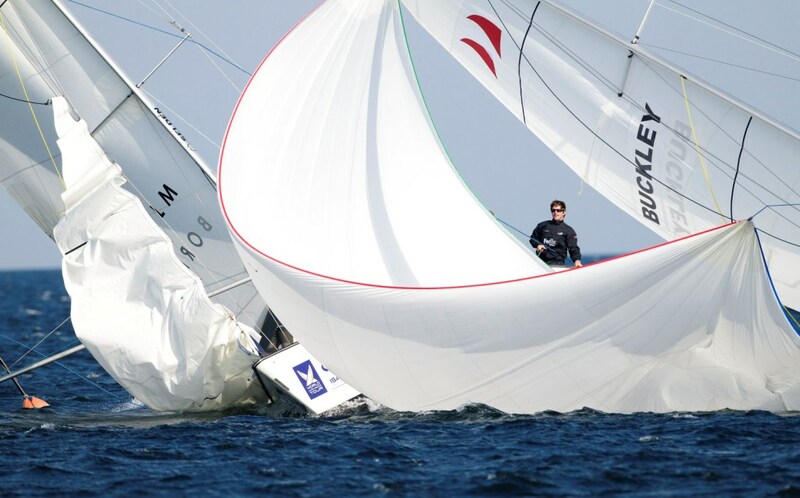 The final day of the 5.5 Metre World Championships brought sunshine and sparkling waters off the Circolo Vela Torbole, Lake Garda, Italy, with more wind than earlier in the week. Two races were able to be held, but it only took one of those to determine the 5.5 Metre World Champions for 2010. 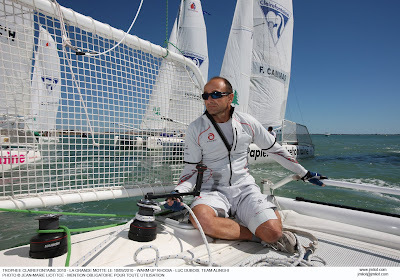 With a 5th place (their worst placing in the entire series), Flavio Marazzi (SUI), and his crew of Andrew Palfrey and Christof Wilke, took first place overall, and were able to sit out the final race, counting this DNC as their sole discard. Kristian Nergaard (NOR) finished second, with a tie on points for third place split in favour of Kenneth Thelen (FIN) over Christoph Burger (NOR). Gavin McKinney (BAH) was first non-European boat in fifth place overall. The rain stole the show today with the river level centimetres from overflowing the banks. Authorities banned all sailing on the water so we have the afternoon to check out the city of Seoul. On the racing front there is insufficient time to complete the current format so we expect to see some changes tomorrow morning. We are currently sitting top of the table but the Australians are in hot pursuit. 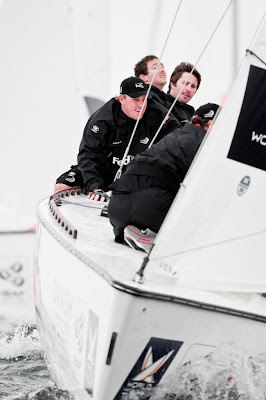 The team would like to thank the Royal New Zealand Yacht Squadron friends, and family for their support. Thank you! Black Sheep Racing is Reuben Corbett, Brad Farrand, Tom Bentham, Nicolas Derberque and James Sandall. The second day of racing at the Buddy Melges Challenge at the US Sailing Center Sheboygan in Sheboygan, Wisconsin, USA, was another interesting day for the 15 international teams in the Elliott 6ms. The winds decreased during the day from a high of 10-12 knots down to less than 5 by the end of the day. The Initial stage was completed and the top four teams in each group advance to the Quarter Final Round Robin while the bottom four teams in each group moved on to the Consolation Round Robin. Three flights of the Quarter Finals were completed and the results show no clear leader with four teams winning 2 of 3 matches and 4 teams winning 1 of 3. The top 8 have all to play for tomorrow with the top four teams advancing to the Semi Finals. ALEGRE, Andres Soriano. 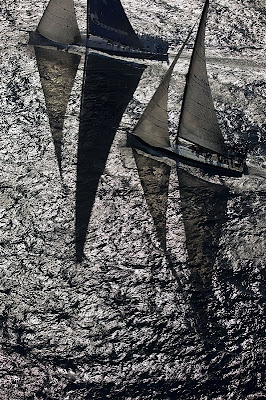 Image copyright ROLEX/Carlo Borlenghi. More often than not yacht races are won by minutes and seconds; today feet and inches played a part in the results on day four of the 2010 Maxi Yacht Rolex Cup. 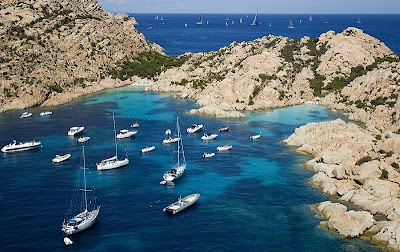 Two yachts touched hard unforgiving rocks that have caught out so many time and again on this seemingly benignly named emerald coast of Sardinia. Cutting corners when you draw close to five-metres is a game of chance involving the finest of margins. Whilst the campaigns of Rán (GBR) and Container (GER) ground to a jarring, gut-twisting halt, others continued to push onwards to their destiny. For those with aspirations of glory the penultimate day of racing was crunch time in more ways than one. TITAN 15, SHOCKWAVE and RAN. Image copyright ROLEX/Carlo Borlenghi. Today’s skipping stones were: Y3K (GER) and Indio (ITA) in Wally, both scoring five points over their two windward-leeward races; OPS 5 (ITA) took advantage of a confused situation to scoop a first win in the Mini Maxi Rolex Worlds for a Racer/Cruiser yacht; Esimit Europa 2 (SLO) made use of her waterline length and mast-height to cruise to victory in Maxi. 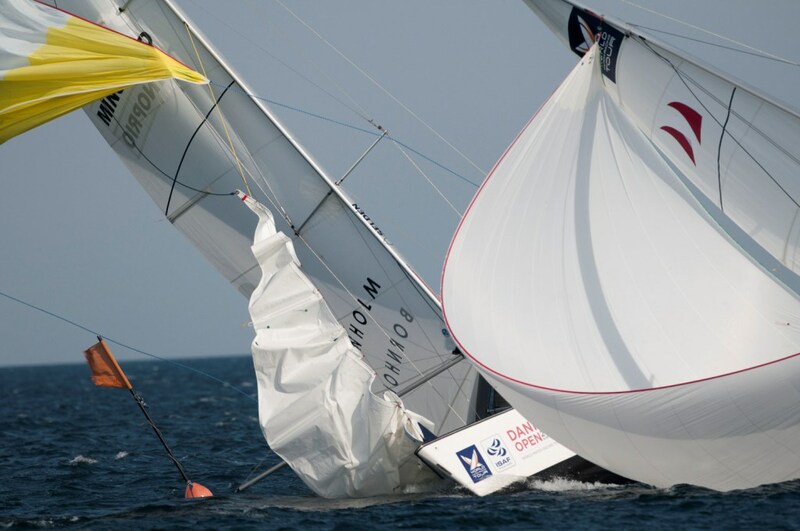 The Supermaxi match was secured by Gliss (SUI) and, in the J’s, Velsheda (GBR) finally showed her true colours getting the better of Ranger (CAY). ESIMIT EUROPA 2 and BELLAMENTE. Image copyright ROLEX/Carlo Borlenghi. Going into the final race day, those in control of their fate are: Claus Peter Offen’s Y3K in Wally, with a three-point lead over Lindsay Owen Jones’ Magic Carpet 2 (GBR); Igor Simcic’s Esimit in Maxi with cushion of two-points over Irvine Laidlaw’s Highland Fling (MON); Hetairos (CAY) in Supermaxi is looking down on Hasso Plattner’s Visione (GER), one point back; John Williams and Ranger leads Ronald de Waal and Velsheda (GBR) by a whopping nine-points; and, in the Mini Maxi Rolex Worlds, Andy Soriano’s Alegre (GBR) has a five-point margin over Niklas Zennstrom’s Rán, whilst Brian Benjamin’s Aegir (GBR) looks most promising for the Racer/Cruiser title with a twelve-point gap to Massimo Violati’s OPS 5. RANGER. Image copyright ROLEX/Carlo Borlenghi. The Wallys undertook two windward-leeward races of 8 and 8.8 nautical miles in light breeze. The piece of knotted string that had to be unwound by the Mini Maxis, Maxis, Supermaxi and J-Class was a convoluted 38 nautical-mile course, which ended being shortened for two of the classes after the wind in the middle part refused to entertain the biggest boats in the yacht racing world. 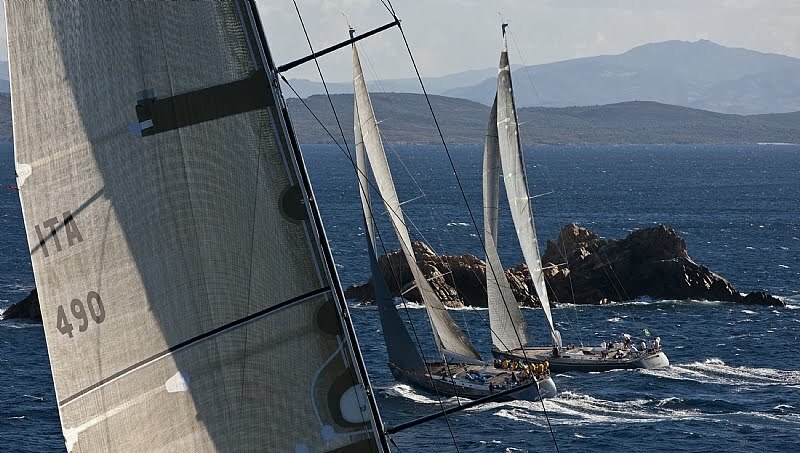 The long course comprised a short beat to a windward-mark, followed by a close reach down to the channel between Isola delle Bisce and Capo Ferro, a fetch to Secca di Tre Monti and then a sharp right turn to Monaci. Wind for this period was difficult, but by comparison to what lay ahead it was an easy piece of the puzzle. At Monaci everyone hardened up to take on a beat to Barrettinelli di Fuori in a dwindling supply of wind. The left turn into the archipelago and run down to Spargi, which was left to port, looked even worse. Thankfully, from Spargi onwards it was downwind, but not downhill in wind strength, all the way home to Porto Cervo. TITAN 15, William I Koch past Barrettinelli di Fuori. Image copyright ROLEX/Carlo Borlenghi. If the beat to Barrettinelli was a head scratcher for the strategists, the rounding of Spargi may have led to a number jumping ship as the island formed a sponge sucking in the yachts, as a slow-moving tail back was established off its western shore. There was sufficient gas in the tank to keep boats moving, but painfully, painfully slowly for yachts more accustomed to having it all their own way. Esimit escaped the trap. Her time around the full course a staggering forty minutes faster than Highland Fling. The Mini Maxis and Supermaxis will be thankful that there were no yachts fast enough to beat the rapidly set shortened-course finish line at Secca di Tre Monti. 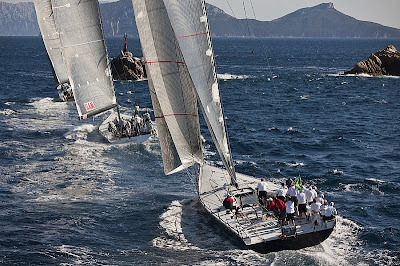 In the Maxi class, Singularity (GBR), Farewell (ITA) and DSK Pioneer Investments (ITA) were forced to sail the complete distance. Shockwave (NZL) was the first Mini Maxi to cross the line. Owner Neville Crichton viewed this as positive, but his overall result as a disappointment after a promising start. Shockwave was the only boat to reach Monaci before the 30.5 metre Esimit, no doubt a satisfying achievement for the blue boat’s former owner. Had she not been stymied subsequently by the wind, Shockwave would have been odds on favourite to reach the next turning mark in the lead too, so much was she in control. Racing past Capo d'Orso. 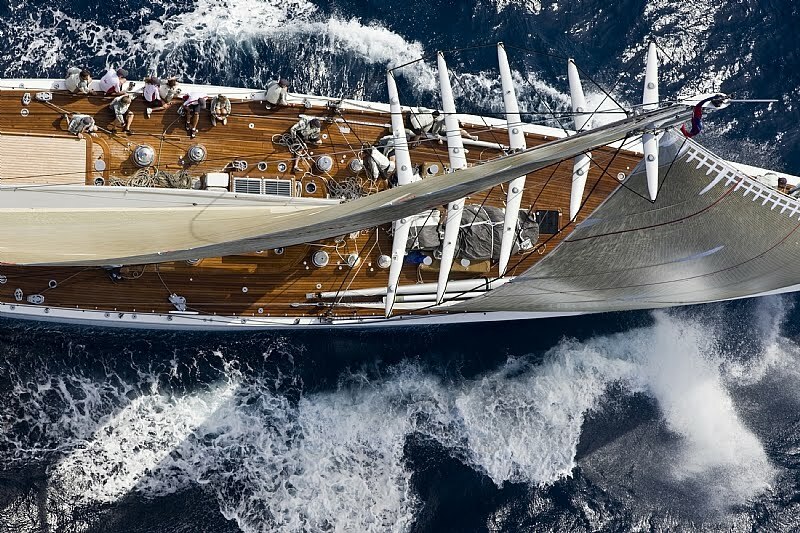 Image copyright ROLEX/Carlo Borlenghi. Licking their wounds in Mini Maxi are Container and Rán. At press time Udo Schutz’s Container is the worse off. Her racing series is definitely over after her encounter with the rocks off Isola del Bisce. According to the crew it was a total surprise to strike the hard stuff, the chart showed them to be in at least 10-metres of water. Perched on the mystery outcrop, the German mini maxi formed a temporary mark warning the passing fleet of the perils of Porto Cervo in a graphic manner. ALLSMOKE and WHISPER. Image copyright ROLEX/Carlo Borlenghi. 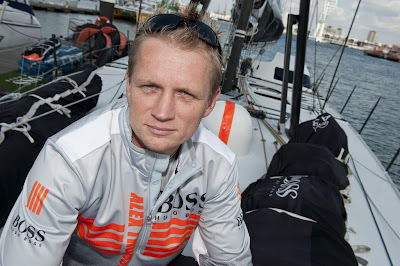 Velsheda’s win in Supermaxi has done little to influence the outcome of the J Class battle. Ranger’s commanding position will have cheered the crew who, according to bowman Geordie Shaver, had the A1 up and down so many times it started to look like a venetian blind. Hasso Plattner has cause to be disappointed with today’s efforts on Visione (GER), which finished third. Hetairos pulled a superb victory out of the hat and now leads the division. AEGIR, Brian Benjamin. Image copyright ROLEX/Carlo Borlenghi. With the struggles with wind and rocks unfolding elsewhere, the Wallys will have appreciated their decision to put a couple of short-course races into their programme. 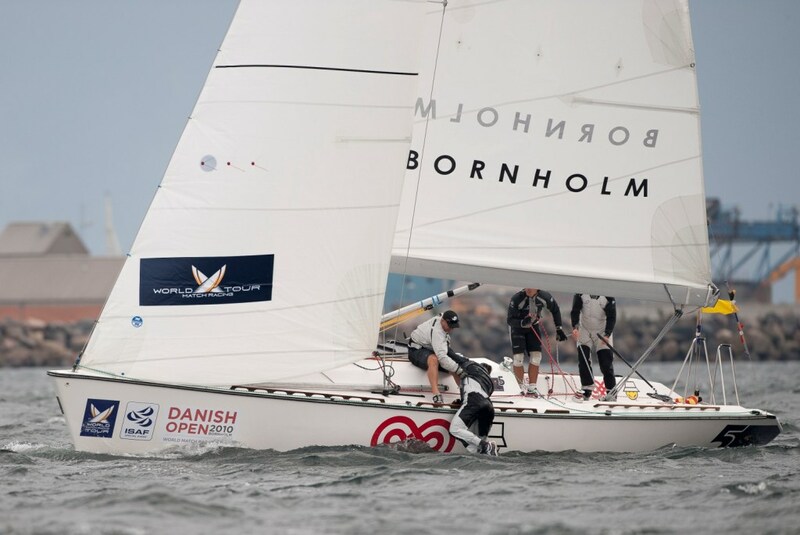 Y3K and Indio both accumulated five points over the two races, although the German yacht included a win in her scoreline. Her compatriot yacht Thomas Bscher’s Open Season took the other win. Maxis beat upwind behind Tahiti beach. Image copyright ROLEX/Carlo Borlenghi. Tomorrow sees the final manoeuvres for the fleet. The Mini Maxis will hope to get in two windward-leewards, whilst the remaining classes will undertake a coastal course. Nothing is over until it’s over and, with the risks associated with sailing these waters brought home with clarity today, even those leading overnight face an uncertain future. The Maxi Yacht Rolex Cup is organized by the Yacht Club Costa Smeralda in conjunction with the International Maxi Association (IMA). From the most luxurious, through the most traditional, to the most advanced monohulls afloat today, the Maxi Yacht Rolex Cup is nothing if not an astonishing line up of sailing power. Day two of the Hahn River International Match Race started with an unusual briefing where all classes other than ours were held ashore. This was due to heavy overnight rain, an outgoing tide and a partial release of the dam upstream which formed a fierce current. The organising authority was concerned for the safety of the smaller yachts as the current could potentially sweep them away. Today’s breeze was unlike yesterdays as we had light puffy patches with the odd solid spurt coupled with that ever increasing current. We won all three of our races today but there was plenty of drama. The first race was clean, nice start, sailed for the pressure and stayed in phase to take the gun. In race two, again we had a good start but the breeze died out completely near the separator mark allowing the boats astern to catch up, however we kept our lead until the bottom mark. The Korean team took the lead at the bottom mark but they copped a penalty in doing so. We kept the game close and passed them moments before the finish, penalty still outstanding. Race three was a top of the table clash, Australia vs New Zealand. After controlling the early exchanges in the prestart, Reuben misjudged the tidal effect in a dial up forcing contact from where we were rightly penalized. 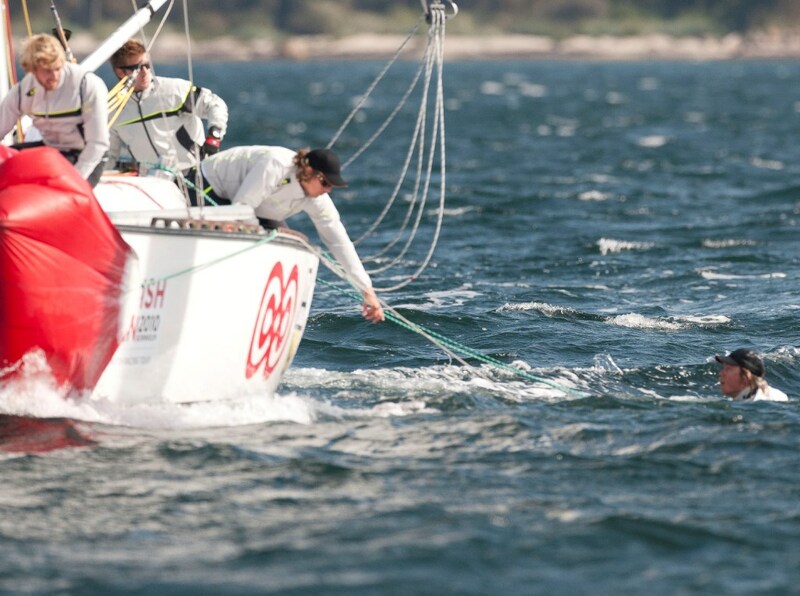 However, we kept control for the remainder of the prestart to shut the Aussies out at the start boat. Starting with a sizable margin we grew our lead to complete the penalty turn on the second beat and remain ahead to notch the win. The race committee will no doubt plan to finish the round robin tomorrow and start the semi finals. Black Sheep Racing in Korea is Reuben Corbett, Brad Farrand, Tom Bentham, Nicolas Derberque and James Sandall. 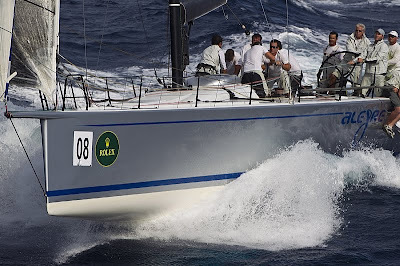 Matt Allen's Jones 70 Ichi Ban during the 2009 Rolex Sydney Hobart. 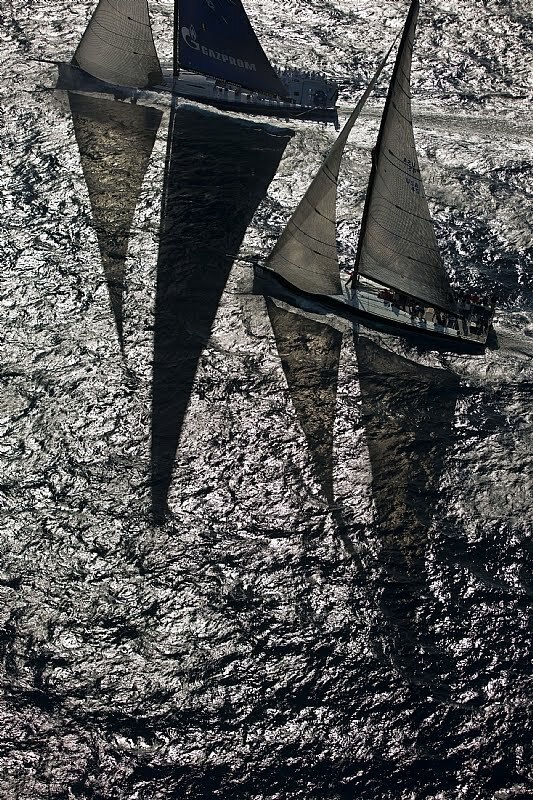 Image copyright Daniel Forster/ROLEX. Within minutes of the release of the Rolex Sydney Hobart 2010 Notice of Race, the Cruising Yacht Club of Australia had received its first five applications for entry, and within 24 hours this figure had climbed to twelve. 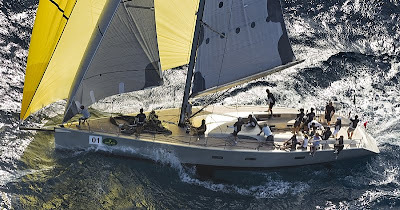 Nicholas Bartels’ newly acquired Cookson 50 Terra Firma from Victoria was the first entry, closely followed by Immediate Past CYCA Commodore Matt Allen’s Jones 70 Ichi Ban. Stepping up from his Sydney 47 of the same name, Bartels is pleased with the Cookson 50’s performance in two recent regattas. 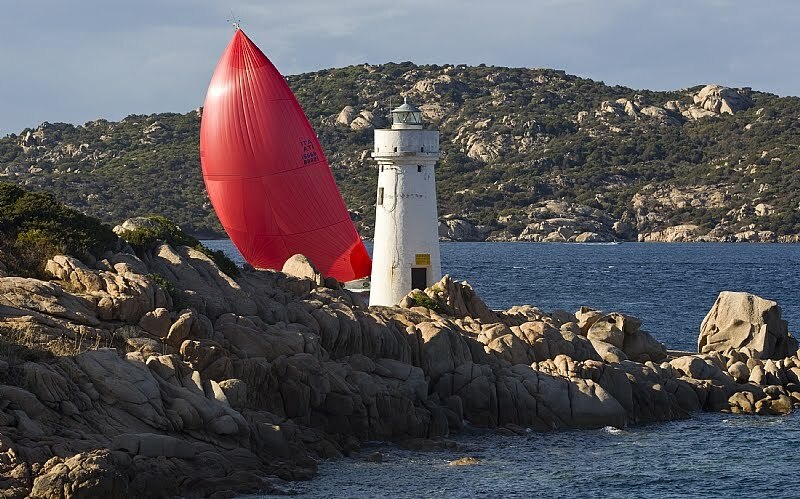 “We’re looking forward to the Rolex Sydney Hobart and the lead-up regatta, the Rolex Trophy Rating Series. We have a great crew that includes Barney Walker and we’ve already started our race preparation and crew training,” he added. 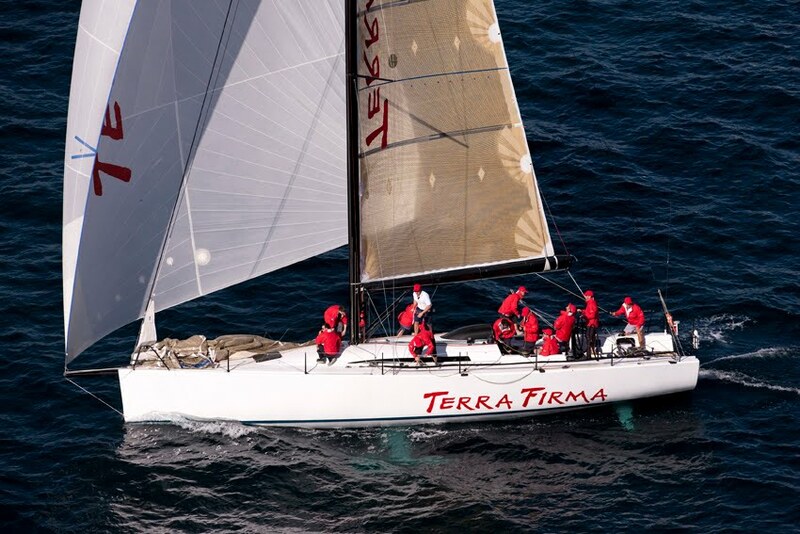 Once Terra Firma returns from the sunny Whitsundays next month, she will be based in Sydney and will compete in some of the CYCA’s Blue Water Pointscore races. Nicholas Bartels' Cookson 50 Terra Firma. Image copyright Andrea Francolini. Matt Allen’s Jones 70 Ichi Ban is always well campaigned in the tough 628 nautical mile race. After losing her mast on the return journey to Sydney from Hobart last year, Ichi Ban has spent most of the year on the hardstand at Azzura Marine in Newcastle. Allen is currently awaiting the arrival of his new rig from Spain and is in the midst of getting the boat ready for this year’s race. 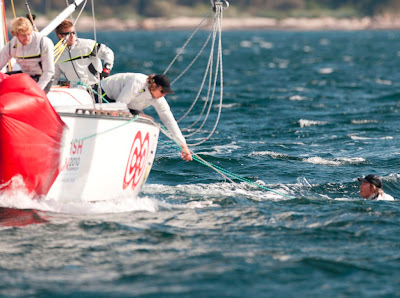 Ichi Ban’s best results include second across the line to Wild Oats XI in 2006 and third over the line in 2007 and 2008. This will be Allen’s 22nd race to Hobart. CYCA member Greg Zyner’s Radford 12m Copernicus was another of the early applications. “My goal for this year’s race will be to have a better start and finish than last year! We had some issues getting out of Sydney Heads and got stuck at Iron Pot for six hours,” Zyner confessed. “We got into the Derwent River just on sunset and we could see the sun and the breeze dropping. It was a very frustrating time from 8pm until 1am with no breeze, the only things keeping us going were the hot chocolate and the 16 other boats around us at the time. “I have a good crew again with Felicity Nelson, Jim Nixon and Bob Moore onboard – all who’ve sailed with the legendary John Walker on his boat Impeccable,” Zyner added. Commenting on the number of applications for entry received to date, Commodore Garry Linacre said: “It’s encouraging to see the strong number of applications received so quickly. The introduction of online entry is proving popular with skippers and boat owners. Within 15 minutes of the application for entries going online we received five entries. Of the expected entries, the Commodore said: “We are anticipating a strong fleet of 90-100, with competition tight from well campaigned yachts such as Stephen Ainsworth’s RP63 Loki and Ray Roberts’ new STP65 Evolution Racing in the running for the overall win. The level of interest from around Australia and overseas is strong,” the Commodore said. 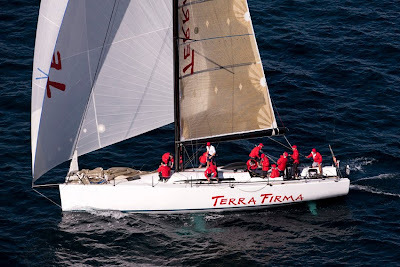 Four Victorian applications have been received, including Terra Firma, which is sailing under the burgee of Sandringham Yacht Club, together with Calm, the TP52 owned by Jason Van der Slot, Graeme Ainley and John Williams; Paul Buchholz’s DK46 Extasea representing Royal Geelong Yacht Club and Andrew Lawrence’s Bakewell-White Z39 Jazz Player, representing Royal Melbourne Yacht Squadron. Applications for entry have also been received for David Cutcliffe’s Beneteau First 36.7 Crossbow from Sydney’s Balmain Sailing Club, Rob Reynolds’ DK46 Exile and Grant Dawson and Brent Lawson’s Kerr 11.3 Kerisma, both sailing under the Middle Harbour Yacht Club burgee, Rod Skellett’s Pogo 40 Krakatoa II representing the CYCA and Murray Wilkes’ Bavaria 39c Sassy representing the race finishing partner Royal Yacht Club of Tasmania. An application for entry was received late yesterday from leading line honours contender Wild Oats XI, the 100ft super maxi owned by Robert Oatley. “The 628 nautical mile Rolex Sydney Hobart is renowned as one of the most significant and toughest ocean races in the world,” Commodore Linacre said. “It is an iconic Australian sporting event and each year the race throws out the gauntlet of new challenges to participants. 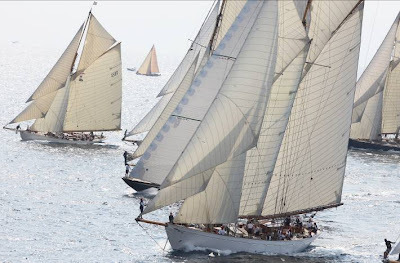 “On behalf of the Cruising Yacht Club of Australia it’s my pleasure to invite owners and charterers of eligible boats to participate in the 66th running of the Rolex Sydney Hobart which will start from Sydney Harbour at 1pm on Boxing Day, 26 December,” the Commodore concluded. The Rolex Sydney Hobart Yacht Race will be preceded by the Rolex Trophy, to be conducted on the waters off Sydney Heads. 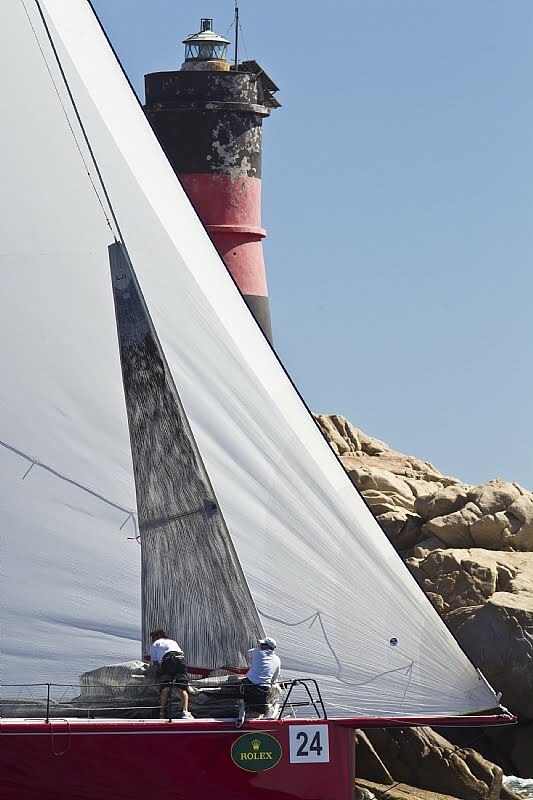 The racing for the one design classes, including Farr 40’s and Sydney 38’s will take place between 10 – 12 December and the IRC and Performance Handicap boats between 16 and 19 December 2010. The Rolex Trophy Passage Series will take also take place on 18 and 19 December. The Notice of Race for the Rolex Trophy will be published later in the year. 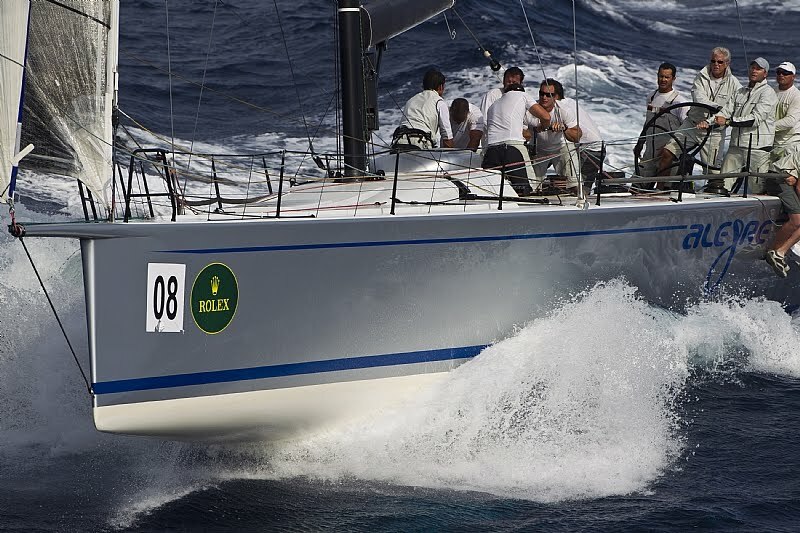 Rolex has been the principal sponsor of the Rolex Sydney Hobart and Rolex Trophy since 2002 and recently renewed its sponsorship of the blue water classic and its associated regattas for a further five years, up to and including the 2015 Rolex Sydney Hobart Yacht Race. The Rolex Sydney Hobart Yacht Race 2010 Notice of Race is now online at http://rolexsydneyhobart.com/editorial.asp?key=1711 with applications for entry being accepted online. 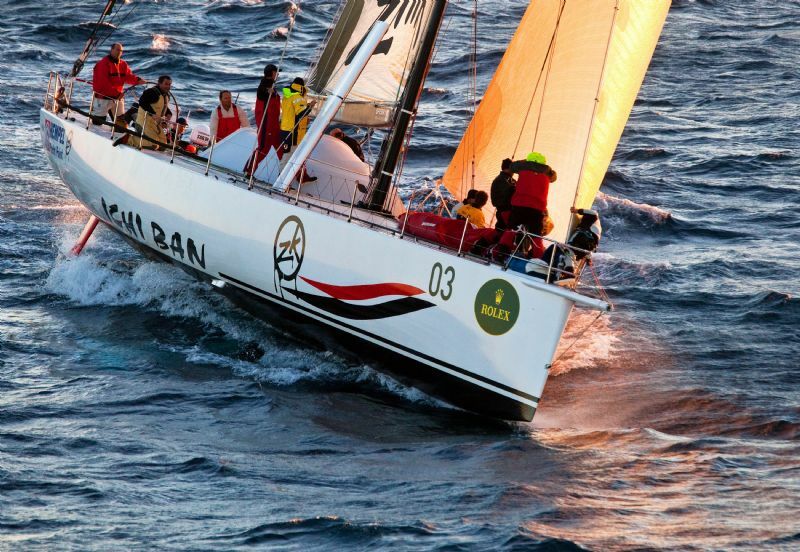 Applications for entry for the Rolex Sydney Hobart 2010 close on 1 November 2010 at 1700hrs AEST. Racing got underway very early today at the Buddy Melges Challenge, with the first race just after 9am. The temperature was in the low 50's but the wind was steady, blowing around 6kts. We had a great morning with some good racing. We finished the day 3-1 in our group, and we have two more races tomorrow to finish the round robin off. We started off the day with a bye race due to the odd number of teams in our group, but then got to the racing with our first two races against Ru Wang from China and Anne Marie Shewfelt from Canada. After good prestarts with both teams, we took control of the races early and led to the finish. Our third race of the day was against our USSTAG teammates Genny Tulloch. We split ends on the start with us on the right and Genny taking the left. Both boats came back together half way up the beat with Genny being about one and a half boat lengths ahead. We had a short tacking duel for the second half of the beat and closed the gap to be less than a boat length behind at the top mark. Downwind, Molly did a fantastic job of keeping the spinnaker full through the gybes despite the light winds. We managed to pass her and round the leeward mark one and a half boat lengths ahead. Upwind, we lost a little of our lead but again on the downwind leg, pulled ahead and took the win to take our record to 3-0. Our last race was against Samantha Osborne from New Zealand. We had a great start and led her around the whole race course until the last leg. We made a mistake on where we placed our gybe and she rolled over us. Because the wind was so light, she maintained her speed and we lost a bit and consequently, she pulled ahead of us. We made a strong attempt at re-passing her and we closed a considerable amount of distance on her at the finish, but couldn't quite get it all back and lost by one boat length. It was a good race and she did a excellent job of keeping close to us upwind so she could be in a strong attacking position downwind. We know where we made our mistake so hopefully we've learned from it and won't do it again. Tomorrow we finish the round robin, when the top four teams in each group will go into the quarter-finals and the bottom four teams in each group go into a round robin for 9th-15th place. You can check the regatta results on the regatta website. There is also live video and tracking so you can follow along live too. 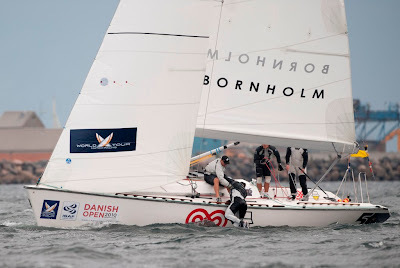 Today was the first day of the Danish Open, the seventh stage of the World Match Racing Tour being held on Bornholm Island situated between Sweden and Denmark. Joining us for this regatta is our big man Jono Spurdle on the pit and Shaun Mason running the bow. It was our first time racing the DS37s in challenging fresh conditions and after over a month of racing in less than 10kts we were excited to go for a send. We raced in the first three races of the round robin and went down in each match, we spent the remainder of the day off the boats with byes. The wind was consistently blowing 25 kts with gusts of up to 30 kts at times. We learnt quickly that these boats are overpowered with big mains and very physical. 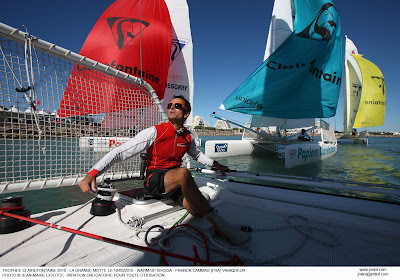 We raced against Mads Ebler, Mathieu Richard and Adam Minoprio ranked 13th, 4th and 1st respectively in the world. Our best race of the day was against Mathieu Richard. In the prestart we ended up coming to the line with the French to windward but we were happy with the left. Off the line it was a long starboard tack and we did well to work up into them but not quite quickly enough and they tacked away on port lay. We followed tacking right onto a left shift so we were to windward breathing clear, Richard kept closed hauled well over lay and we both ended up flapping head to wind well above the mark. Coming close to an obstruction they bpre away and we followed. The downwind was very gusty and we were able to make small gains and were right on his tail around the bottom mark tacking as soon as we could. A tacking dual ensued but nearing the top we got on the wrong side of a couple shifts and were unable to be close enough on the run to make a pass. We were happy to see that our boat speed was good against the world number 4 and are excited about the remainder of the races in the round robin. The 5.5 World Championship is valid: five races as of today, with two races sailed this morning. A picture-perfect day of sailing for the 5s on Lago di Garda. Early start at 09:00, a sunny day and northerly winds at about 18-20 knots. Some crowded mark roundings, a few breakdowns and Flavio Marazzi increasing his lead with a first and a third place and 8 points. Bahamian sailor Gavin McKinney "John B" experienced a spinnaker crash in the first race and did not finish but he led the entire second race and got the bullet! Round 2 of the Sail Downunder Series, Sail Sydney is one of only two ISAF Grade 1 events in Australia and the big news is that for the first time, the regatta will be run during weekdays only, from 6-9 December, making it a fairer playing field for all. To be held from Monday 6 to Thursday 9 December, competitors will not have to worry about dodging the weekend traffic, including ships and ferries, so will be able to concentrate on the job at hand – to win qualifying points towards their Olympic campaigns. 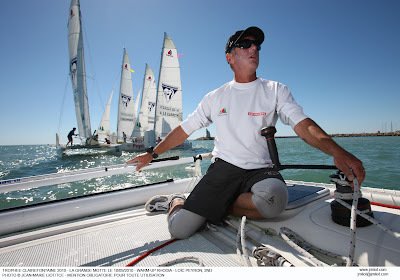 Coming on the back of the Perth International Regatta (the test event for the 2011 ISAF Sailing World Championships) to be held from 16- 21 November and Round 1 of the Sail Downunder Series at Sail Brisbane from 29 November to 2 December, a good international fleet is expected at Sail Sydney. Olympic classes for Sail Sydney this year are: 470 Men’s and Women’s, RS:X Men’s and Women’s, Finn, Laser, Laser Radial and 49er. Following an excellent summer season in Europe, Australian entries will feature largely at Sail Sydney. 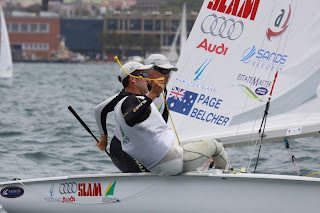 Heading the Aussies will be Mathew Belcher and Malcolm Page, the reigning 470 world champions, who went on to capture silver at the final round of the ISAF Sailing World Cup at the Olympic venue in Weymouth last month, catapulting them to the top of the ISAF World Ranking list after their win. Tom Slingsby (Laser) and Nathan Outteridge/Iain Jensen (49er) won Gold at Weymouth. Slingsby went on to win the Etchells Worlds with John Bertrand and Andrew Palfrey in late August, then went immediately to the Laser Worlds where he had a stunning victory to claim his third Laser World title on Sunday. 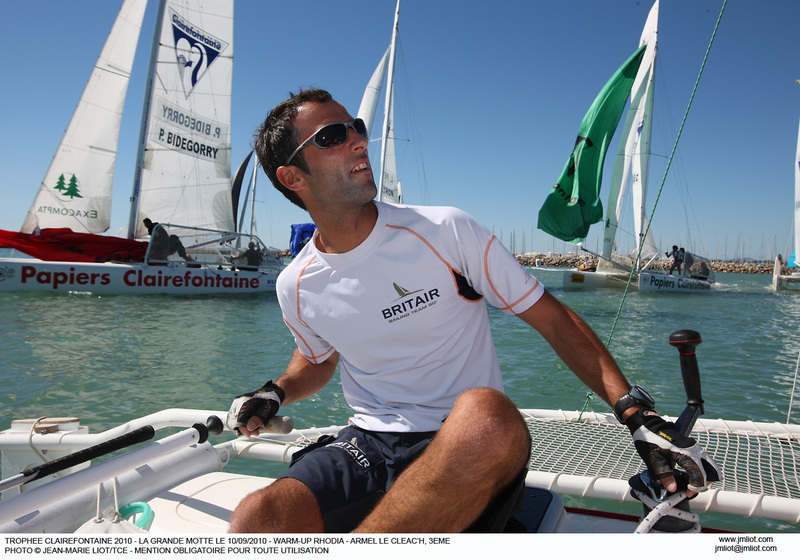 Outteridge went on to win the Moth European Championship straight after Weymouth. 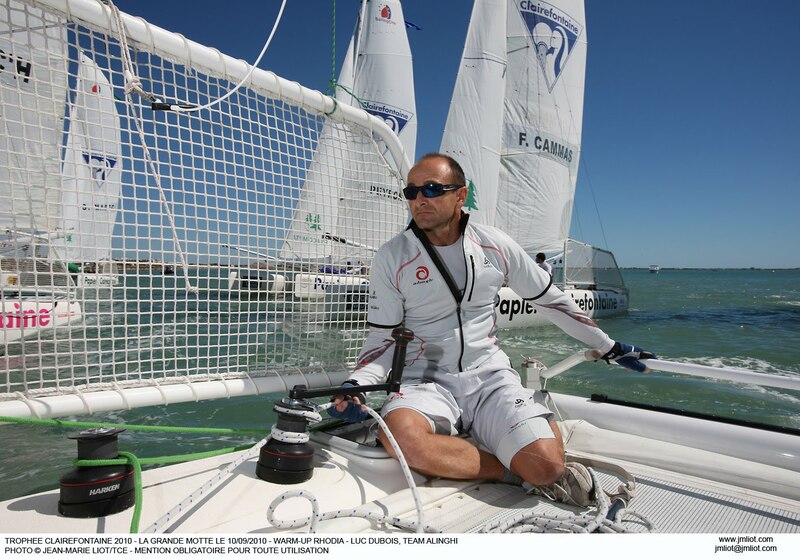 Early in the year, he and Jensen, defending their 49er world title, won the silver medal at the 2010 Worlds. Brendan Casey who did well to finish eighth overall in the Finn class at Weymouth after an extended break from the class, also did an exceptional job at the Finn Gold Cup (the World Championship) where he finished 10th overall against a class field. Other Australians will include Krystal Weir, who has moved back into the Laser Radial after competing in the now defunct Olympic class Yngling at the Beijing Games, and triple Olympian Jessica Crisp (RS:X class). Having put her 13th place at this month’s Worlds behind her, Crisp is always on the money on her home waters. 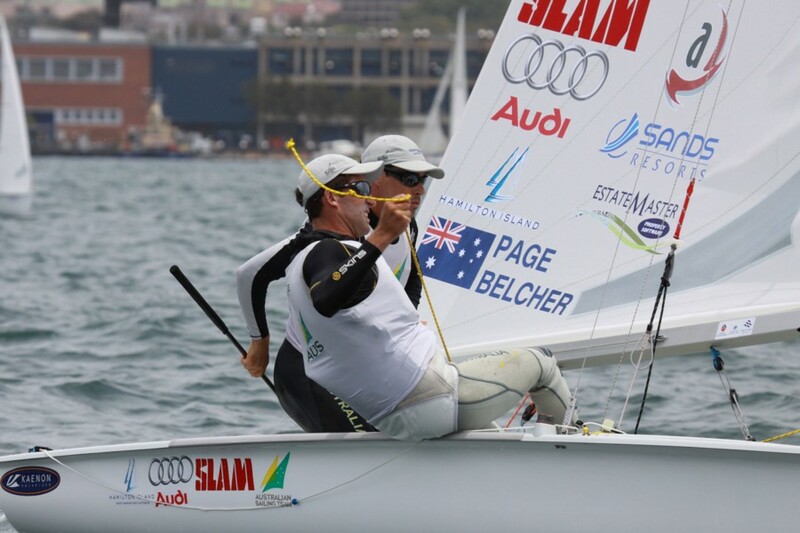 The other major announcement for Sail Sydney, hosted by Woollahra Sailing Club, in conjunction with Royal Sydney Yacht Squadron and Royal Prince Edward Yacht Club, is the inclusion of two of the three Paralympic classes; the 2.4mR single-handed and theSKUD18, a two person boat. Australians Dan Fitzgibbon (Qld) and Rachel Cox (WA) returned to the SKUD for the first time this year after winning Silver at the Paralympic Games in 2008. 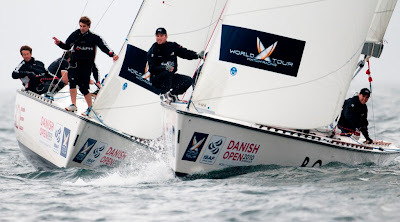 They won Bronze at the 2010 IFDS Worlds, their first major competition, and went on to win Gold at the Sail for Gold Olympic and Paralympic event in Weymouth in August. The duo is expected at Sail Sydney, along with main Aussie rivals, Ame Barnbrook and Lindsay Mason from NSW, who have racked up some great results since joining forces this year, including leading Fitzgibbon/Cox at the IFDS Worlds, but ultimately finished fourth in their first international competition together. Matthew Bugg finished a brilliant sixth in his early campaign for Paralympic selection in the highly competitive 24mR single-handed class. The Tasmanian, who began competing internationally only this year, will head the Australian line-up at Sail Sydney. 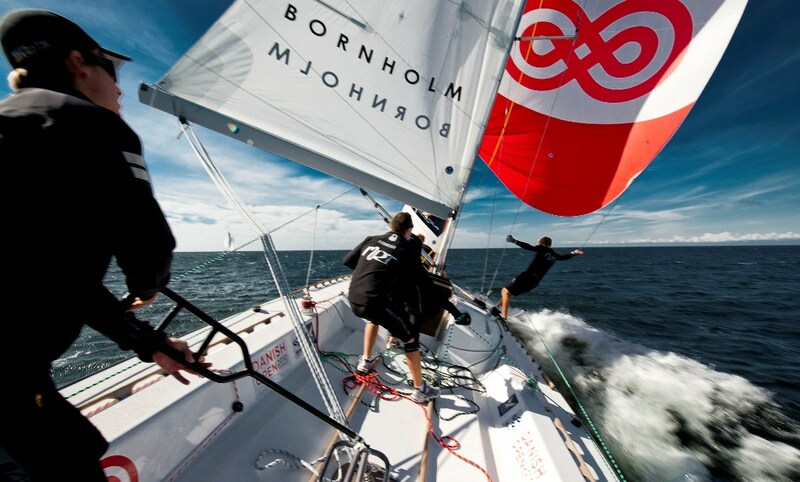 Other classes include eye-catching speed machines; the Moth, 505, Hobie 16, 29er and 29erxx and Bich Techno 293 classes, along with the Laser 4.7 and 420 classes. 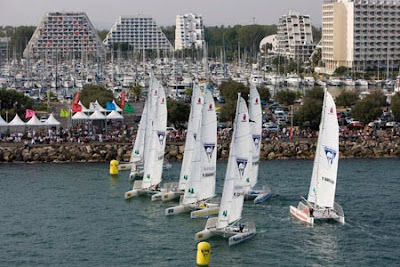 Entries for Sail Sydney must be received no later than 1700hrs on 12 November 2010. Entries received after that time will be subject to a late entry supplement. Sail Sydney is proudly supported by Steve Jarvin Motors, Alphaboat, Tohatsu and Sport and Recreation. Sailing Elliot 6 metres. Supplied image. I woke up to a brisk 50 degrees for my morning run today in Sheboygan, WI. The chilly wind was blowing in the mid to high teens, but nowhere near the 30-40kts we had yesterday when we arrived for this year's Buddy Melges Challenge, a women's grade 1 match race sailed in the Elliot 6m's. 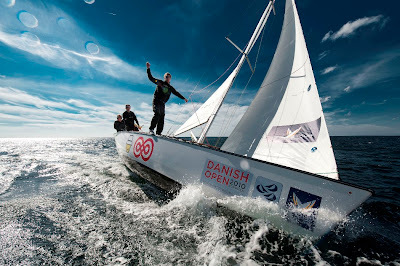 Despite the chilly temperatures, the sailing for the week looks great, with a good forecast and some great competition. There are 15 teams from eight countries competing over the four day event, including defending champion, Samantha Osborne from New Zealand. The racing starts tomorrow, but we do get a chance to sail this afternoon for a practice. As a team, we have been pretty busy since our last event at the end of August. Debbie has been working hard at Tina's Italian Ice's, her ice-cream store, Molly moved house and has been coaching out in San Francisco, and I have done a lot of coaching. 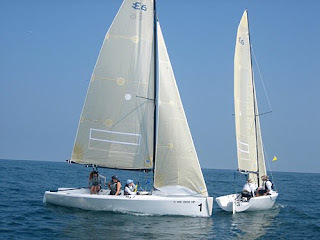 I have been coaching my husband, Brad, and his team in match racing as they get ready for their national championships, and I also did a clinic over Labor Day weekend for Laser and Laser Radial sailors up in Norfolk, VA. The clinic was organized by my brother's company, Sail Virginia Beach/Tunnicliffe Consulting, and had 35 Radials and Laser full rigs in attendance, which was great. As well as competing in the Buddy Melges Challenge, we are training hard now for our Women's Match Racing World Championships which are in two week's time. This week we are here in Sheboygan, then next week we are heading to Noroton, CT for some Sonar training, before we head to Newport on the 19th. We will be taking a detour on the 18th, as we are head back to the Hole in the Wall Gang Camp in CT, a camp for sick kids to attend and get away from their everyday lives. I'm very much looking forward to returning again this year. As for this regatta, they are hoping to have live video streaming from the regatta website, where you will also be able to check out the results. Racing begins tomorrow morning at 9am. The fleet went out at around 1430 today in Torbole and sailed one race only. 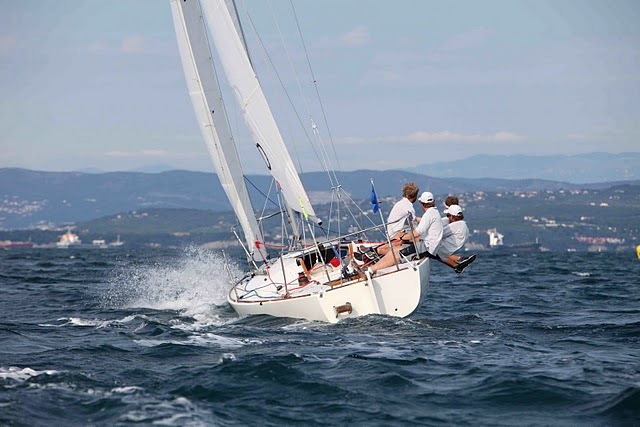 First place went to Finnish boat "Kan-Bej 2" helmed by Kenneth Thelen, followed by two Swiss boats, "Ali Baba" Flavio Marazzi and "Pungin" Hans-Peter Schmid, second and third respectively. After three races, Marazzi leads the championship with a total of 4 points. Christoph Burger is second with 9 points and Ken Thelen is third with 10 points.